We’re so excited to be kicking off a new series of Titles@Table40 dinners (and a brand new year) with local politician Monique Begin! Elected to Parliament in 1972 as one of the first female MPs to hail from Quebec, Begin was not only a breath of fresh air in the House, but a trailblazing female politician! 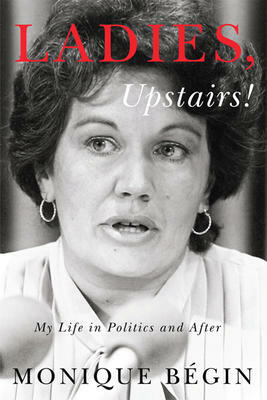 Spanning her life experiences from a childhood spent in Italy, France, and Portugal, through her days as a parliamentarian and Cabinet Minister, to her post-political life as a member of the academic world, Begin’s riveting memoir Ladies, Upstairs! is a wonderful, inspiring read! The evening starts at 5:30pm with dinner, followed by the author presentation and book signing. Tickets must be purchased in advance at the bookstore. The non-refundable cost is $70.00 which includes the cost of the meal (a set menu of three courses with a vegetarian option), tax and tip. All beverages are extra and will be charged at the end of the evening. The Fraser Cafe can accommodate all special dietary needs if we are informed at the bookstore in advance. Call or visit us to purchase your tickets today!